Birthplace : West Hartford, Connecticut, U.S.
John Franklin Enders (February 10, 1897 – September 8, 1985) was an American medical scientist and Nobel laureate. 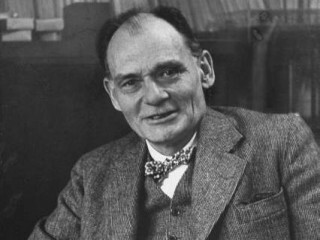 Enders had been called "The Father of Modern Vaccines." John Enders attended Yale, dropping out to join the military for World War I, then returned, earning his Bachelors degree and embarking on a career in real estate. This soon bored him, and he returned to university, this time at Harvard, where he studied literature and planned a new career teaching the classics. He had another change of heart after befriending several medical students, and switched his major to bacteriology and immunology. After graduation, he remained at Harvard as a teacher and researcher for another decade and a half, until he was offered a laboratory of his own at Children's Hospital in Boston. At the hospital Enders focused his attention on viral diseases, and developed a method for detecting antibodies to the mumps virus, a breakthrough which led to a skin test that could diagnose the disease. Enders, working with Thomas H. Weller and Frederick C. Robbins, became the first to grow the poliomyelitis viruses -- polio -- in tissue cultures, an accomplishment that allowed Jonas Salk and Albert Sabin to develop vaccines against this crippling disease. For their work, Enders, Robbins, and Weller shared the 1954 Nobel Prize in Physiology or Medicine. Enders' father was chairman of the Hartford National Bank and Trust Co. His grandfather, Thomas Enders, was hired in 1854 as the first full-time employee of Aetna Insurance, and 18 years later he was promoted to become Aetna's President. 1981: Galen Medal of the Worshipful Society of Apothecaries, London. View the full website biography of John F. Enders.